Today we hear a Lot about 'THE QUALITY OF LIFE' and that applies to our Koi as well - to provide a 'Good Quality Food' ensures that their lives do have that bit of Quality. Here at Hemphill's Garden and Aquatic Center. 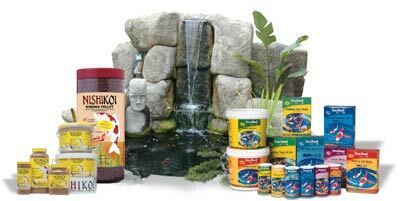 we sell only the 'Best Quality Fish Food for Feeds' for the health of our Koi and other pond fish. We can highly recommend the Koi Food brand names of: Tetra, Pond Care and some others that are made especially to enable the Koi keeper to be able to feed these foods ‘all year round’ .. without the need to change back to a Wheatgerm food for the winter months … these foods are designed to be easily digested, even in cold temperatures where the fish may be looking for food, but of course we do sell Wheat Germ foods for those who wish to feed this food. Wheatgerm food by Blue Ridge and other manufacturers available from PondPals. Would you like to eat Junk Food? Would you feed your own Children, 'Junk Food' ? Of course not! Unfortunately a lot of the 'Bulk Purchased Cheap Foods' sold at the various Koi Shows up and down the country in the summer season - is just that - Junk Food. So be careful what you do feed to your Koi and take our word for it - Nothing will ever replace 'Good Food'. Shop online by selecting items from our store menu shown above. We have stocks of many good foods, included in the above listings ... We didn't expect to sell much Koi Fish Food on the Internet - but we are now sending out more Koi Food than any other Food product we handle - we will be only too happy to supply your orders by mail order / or please call in person if possible. Take a look at each of these products .. We are sure you will agree with us when we say - you simply can't buy better Koi Food for your Koi ..
We also have additives that will enhance your Koi and that can be fed to supplement your Koi's diet .. such as 'Spiravits - which contains vital lost vitamins and minerals .. Spirulina Powder .. always popular to mix in with the foods to really enhance the colors of your Koi.. Although many people might think Koi are simply large goldfish, owners know they have their own special dietary needs. For optimal color and health, feed them special Koi foods rather than goldfish food, or even standard pond foods. We carry a variety of feeder products including vacation feeder blocks and automatic pond feeders. See our full line of fish foods including Blackwater, Blue Ridge Koi Food, Chen Gro, Crystal Clear, Hikari, Laguna, Pond Care Spring and Autumn Fish Food, Pond Care Summer Staple, Tetra, Microbe-lift Legacy Koi Food, Nishikoi, Shoi Koi, Tetra Flaked Food, Tetra Floating Koi, Tetra Floating Sticks, Tetra Growth Sticks, Tetra Koi Excellence, Tetra Variety, and Tetra Wheat Germ Sticks. We offer a variety of pond fish treats by Tetra, Microbe Lift and Laguna including Laguna Pond Fish Treats, Microbe-lift Floating Koi Kupcakes, Microbe lift Enhance Liquid Krill Flavor Enhancer, Microbe Lift Legacy Big Bites Koi And Gold Fish Food, Tetra Jumbo Shrimp, and Tetra Pond Treats. Fish Food - Koi Food - Goldfish Food.